I've heard of the Winchester Mystery House, on how the proprietress of said mansion, Sarah Winchester, is said to have built it to keep the ghosts at bay who might seek out revenge for their deaths at the hands of the Winchester rifle. Regardless of the veracity of said legends, they persists. Winchester attempts to meld those stories into a more traditional horror film that still tries to be contemporary in its frights and gruesome visuals, but it ends up being an unintended comedy. 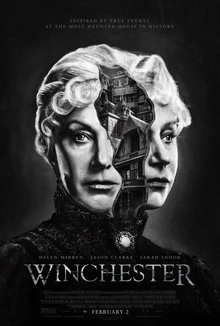 Dr. Eric Price (Jason Clarke), a man with a troubled past who has a weakness for women and a drug addiction, has been asked by the directors of the Winchester Repeating Company to evaluate the mental health of its majority stockholder, Sarah Winchester (Helen Mirren). 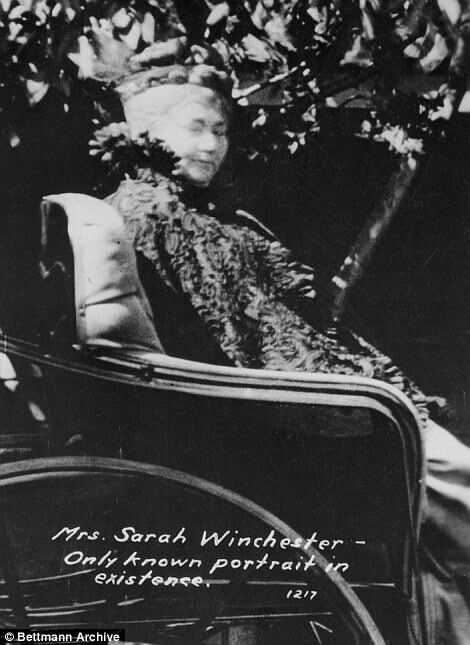 Sarah, the widow of the Winchester founder, has had a continuous construction crew in her California home for years, working nonstop day & night, only to either tear down parts of the house later or bolt empty rooms up. Price sees that there are only two other residents at the Winchester Mystery House: Sarah's niece Marion (Sarah Snook) and Sarah's son Henry (Finn Scicluna-O'Shay). Already spooky things are going on, as Henry has started sleepwalking, and in his state either threatening other people or at one point jumping off a ledge, with only Price seeing this bit and racing to catch him. Mrs. Winchester believes that the spirits of those killed by her company's product are coming after her, and in her madness there is method: the rooms keep the spirits locked in until they accept her remorse, wherein they can be free and the rooms torn down. She, apart from that, is of sound mind and body. Price, however, has an otherworldly connection: he 'died' when his wife shot him, but managed to return from the beyond. Despite his own brush with death, he is a skeptic. However, he sees malevolent spirits jump around him, and sees Sarah apparently possessed by a spirit, furiously drawing out a room that she has quickly built. The room is vaguely familiar to Sarah, and soon we know why. One of her 'servants' is really Corporal Ben Block (Eamon Farren), a Confederate who lost two brothers in the Civil War thanks to the Winchester's superior power over the Confederate weapons. Blaming Winchester for their deaths, he storms into the Winchester headquarters to kill them all, only to end up getting killed himself at the showroom when police storm in. Now, the spirit of Corporal Block has come from the beyond to unleash his vengeance, preying on young Henry as part of his supernatural plot. It takes a battle to defeat him, and to both bring peace to the Blocks and the Winchesters. Having seen all this, Dr. Price himself finds peace with his own past, abandons drugs, and gives Sarah a clean bill of health. I think the big problem with Winchester is that it exists. That might be a bit harsh, but everything about Winchester is so bungled that rather than be scary, it ends up being funny. The fact that Peter & Michael Spierig (The Spierig Brothers as they are billed) are so sincere in their efforts to make everything 'scary' only makes things more hilarious. The servants are all so overly creepy in their looks and mannerisms that any real sense of tension and danger is gone. They constantly throw in those 'jump scares' where some monster pops out at you that again, you aren't scared. Rather, you are amused. Even the family is so overtly 'scary' that you just have to chuckle at it all. No amount of 'jump scares' and overly moody music can save Winchester from being so silly as to be almost a spoof of horror films. Part of me thinks that Winchester would have been better if it had intentionally set out to mock some of the horror conventions rather than try so desperately to use them in the way they did. Bless Mirren and Clarke for trying to take all this seriously, but in their performances, you get the sense that even they knew that Winchester was an unintended spoof and at a certain point gave up. Mirren hopefully had a lot of fun playing the eccentric Sarah, because if this was a sincere performance, Mirren went off the rails. She was at times almost silly as the spooked Sarah, her efforts to 'calm' the spirits playing like farce. Clarke, I think, wanted to play this seriously, and the Spierig Brothers screenplay written with Tom Vaughn, attempted to give him a backstory with his drug problem and haunted past (no pun intended). However, the film had a hard time making him the skeptic when he kept finding himself facing off against monsters and creepy servants left right and center. It takes a particular skill of badness to get good actors into looking like fools, so the Spierig Brothers have that. What is genuinely sad is that the story of Sarah Winchester and/or the Winchester Funhouse make for fascinating subject material without all the hocus-pocus hokum Winchester threw at it. By drowning a potentially good story with second-rate, cliched supernatural overtones more suited to Insidious or Annabelle-type films, what could have been a good time turned into a comical misadventure of supernatural proportions.